The starting point for my card was the chevrons on the wall. Followed by the flower. I used Weathered Wood and Tumbled Glass Distress Inks on the chevron stencil à la Tim Holtz, then stamped the flower on some spare card and sloshed a bit of Tumbled Glass on, then fussy cut it. I drew in a stem and stamped the HB2U either side of the stem then drew leaves around them. I'm entering my card into Simon Says Wednesday Challenge - Anything Goes, and Simon Says Work It Wednesday, where it's also Anything Goes. 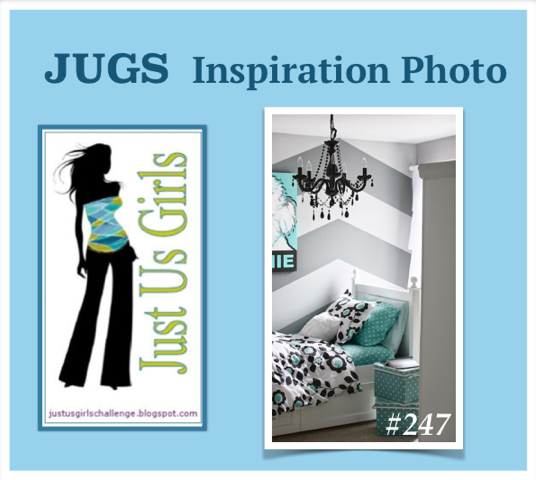 Pop on over the Just Us Girls and join in the challenge (thank for having me, ladies!). GREAT colors! The chevron background is gorgeous - love how you blended the grey and aqua! Another really cool, somewhat 'zen doodle' look to your card! Ended your Guest Designing with a beautiful card! I love the background chevrons and your fun flower! Thanks so much for joining us this month as our GD - It was a pleasure having you!! Love that stenciled chevron with the fun flower! Way to rock the Tim Holtz inks. It's really been a pleasure having you here as our Guest Designer this past month. Another beautiful card! I love that chevron background and, of course, that flower! Thanks so much for sharing your talent with us this month as our Guest Designer over at Just Us Girls! We have loved having you! Love this! The colors are fabulous and I love that background. I just did that one on a card myself! Thanks for being such a great guest! Hope to see you at JUGs again soon! Does just Us Girls allow a guy to comment? I'll put on a wig and some chap stick if it helps. LOL. Believe me, it will not help. YEESH. Great card Shirley.Very creative. Such a beautiful take on the inspiration photo! Love your chevrons and your flower is so pretty! A gorgeous card Shirley, I love your stencil chevron background - pretty colours and a beautiful stamped flower! !